The Manatee aka "Sea Cow." 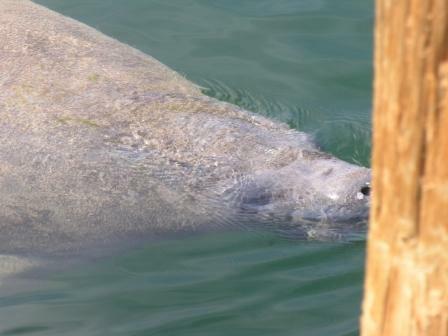 The Florida Keys hosts several marine mammal species, including the endangered West Indian manatee (Trichechus manatus) seen above (manatee photos taken by William Ladd). Manatees are mainly winter visitors down here, unlike other species like the spotted dolphin and bottlenose dolphin which are here throughout the year. We love the manatees! Bill took this shot of a manatee while standing on our finger pier as s/he grazed on the algae of this small fishing boat. Note the wide fan-like tail. They are graceful mammals, though they look awkward. They can weigh a ton. Gentle, but very very powerful. 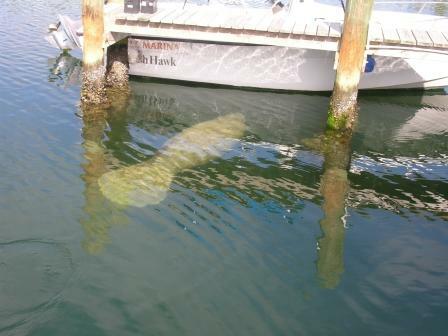 Another shot taken by Bill in our Marina as this manatee grazed along the finger piers. Look at the "hog-like" snout. They are vegetarians. Unfortunately, most of the manatees around the Keys all show signs of being hit by boat props (scars). The manatee above seems to have faired well, looking healthy and happy. You Go (Sea Cow) Girl, Go - Go- Go!! Please! 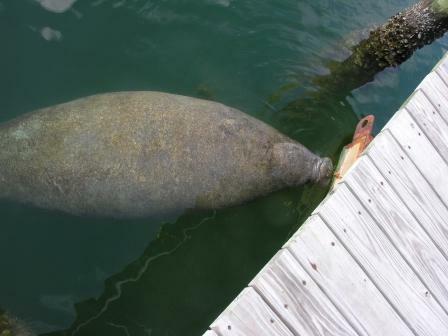 Never allow a Manatee to drink from a freshwater hose... they'll learn that boats bring such "treats" and will be encouraged to venture where boats and people are... boat traffic where they are scarred or even killed by boat propellers. 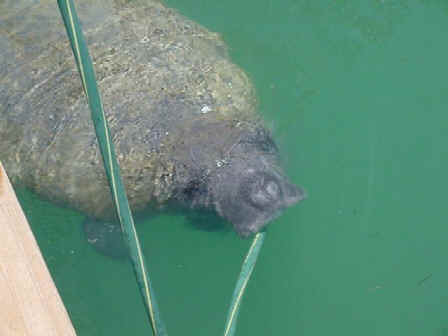 A cruising couple had this manatee at their boat; but once told of the dangers of allowing it to drink from the hose, they immediately stopped supplying it with water. We have three Iguanas here that are very curious. I've done some reading up on them and experts say they are even more curious than cats. I can attest to that truth! 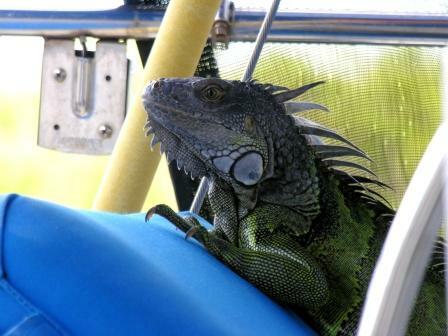 Above, a green iguana (not native to the Keys and are usually escaped or let loose pets) relaxes on our Sport Seats. The iguanas can be a bother as they grow to about six feet in length and eat a ton of foliage, including your flowers and garden. 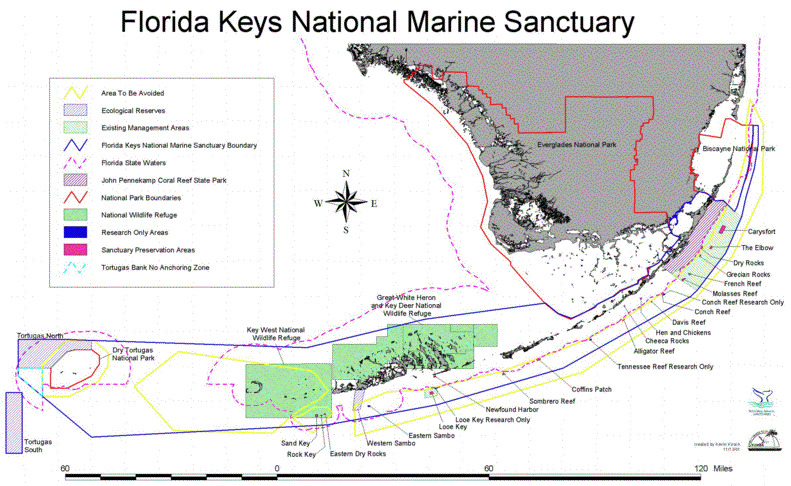 The Keys are looking for ways to eradicate them. They just look like Godzilla to me. 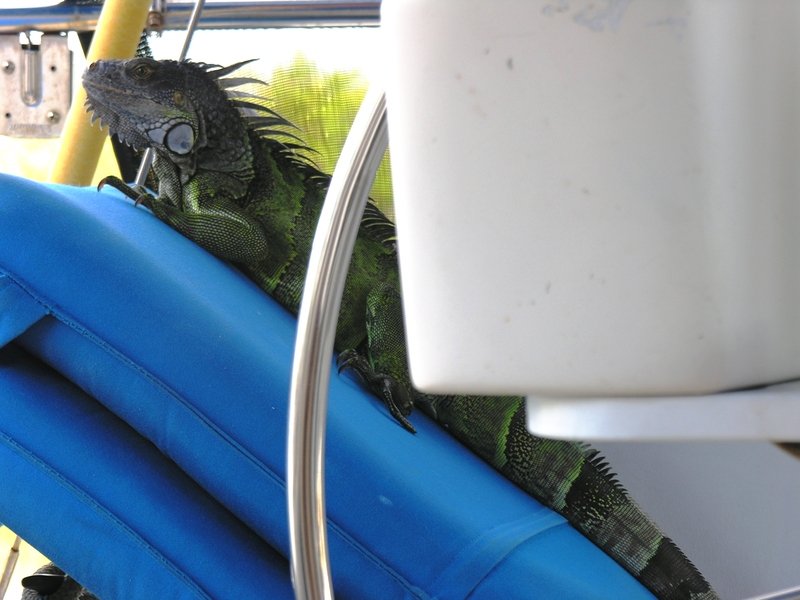 Once, the big red iguana was on our boom and wouldn't budge. Everyone BUT us got pictures of it... he soon bailed, when Bill threatened his solace, and he dove headfirst into the canal. You'd think they would have trouble boarding the boat... they obviously have no trouble at all, and they'll do a Greg Louganis in a heartbeat. Monsters they are. Cute to look at from afar... but the first time you clean up or slip on their poop... you'll reconsider their "cuteness." 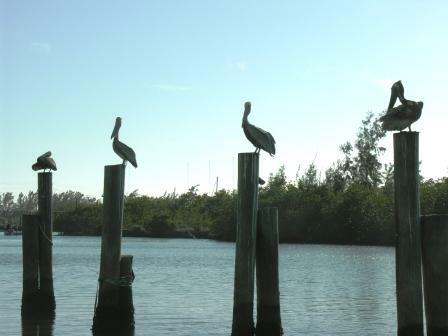 Above, pelicans perched on pilings right next to our boat. We don't have a problem with pelicans or other birds, as we NEVER feed them! Those who DO will get exactly that: DO-DO! ICKY and like acid when it lands on your boat! 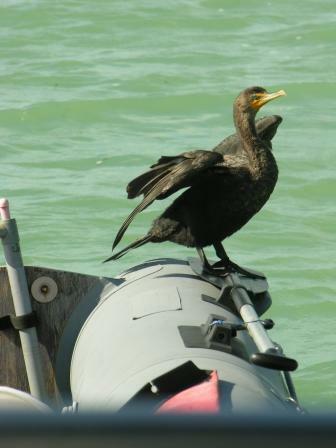 This little cutie decided to dry out his wings while perched on our dinghy. He was very appreciative... and showed us so by not pooping in it!